Sia Furler is the Aussie songstress so determined not to be famous you can barely find a photo of her. She ran an anti-fame manifesto in Billboard, doesn’t appear in her videos and performed live at the Grammy’s with her back to the audience. Having released five studio albums, a few live sets and a greatest-hits, 1000 Forms of Fear is her sixth album and the one to land her finally in the International spotlight. Despite being released in 2014, it refuses to fade away. It follows collaborations and Grammy nominated songs written for some of big name artists; Rihanna’s Diamonds, Ne-Yo’s Let Me Love You, David Guetta’s Titanium, Flo Rida’s Wild Ones, Beyoncé’s Pretty Hurts and Britney’s Perfume; high-concept show-stoppers, heavy on metaphor. And she is a terrific song writer with a good voice, interpreting her own material. Her voice is a broken and cunningly reconstructed instrument, and she uses it as an instrument, like a vintage, breathy saxophone, gliding up and down the scales. Excuse me if I sound churlish, but that is the first problem I have with the album. Yes, it’s a flawless technical production, full of layered sounds, from quiet piano-led percussive riffs through the massive electronic, dance influenced power-ballads, all delivered with Sia’s breaking-down vocal stylings. It’s unfortunate, then, that some of her most heartbreaking and melancholy lyrics of isolation and self discovery are swallowed in a mewling, drawling, stroke-affected style like Stevie Nicks on diazipan. It’s a wilful act of destruction that robs the album of much of its’ power. The second issue is equally problematic. If you still regard the music album as a deliberate compilation of tracks in a certain order, the trouble for 1000 forms of fear is the opener, Chandelier, is clearly the standout track, a massive world-wide hit, grammy nominated, and boosted by the phenomenal Maddy Ziegler video. It is also Sia’s most distinctively Sia performance of the album. 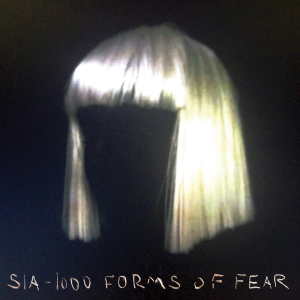 From that first track, Sia somehow loses some of her identity. Overshadowed by her own work and more established artists – the big-note drama of Christina Aguilera, caribbean roots of Rihanna, and the squeaky-helium pop register of Britney – there are some tracks where Sia could be any or all of them. It’s no coincidence Rihanna, Aguilera and Britney all have changed sounds post-Sia as collaborator. So much of the album is about wilful destruction of lyrics, settling for an expressionist art-form that leaves some very fine songs struggling to be heard. If you do want to sing along in the car, you’re more likely to end up with “I lean against the wall” or “I like a constable” than “It’s me against the world.” And that’s a shame, because the lyrics are intensely personal record of lows and highs, a catalogue of distressing metaphors for breakdown that invariably finish with an uplifting statement of intent and reconstructed identity, back into a place of light, of the kind the late Amy Winehouse could never reach. I do believe this to be the most pretentious sounding review we’ve ever produced; but Sia invokes that kind of deep response.